Launching the newest Guatemalan Rum to the market. Nook Kitchen will host a Tiki cocktail party with Casa Magdalena which is a collaborative effort between House Spirits Distillery and Ingenio Magdalena, the largest producer of sugar in Central America. Free Event. Hors d'oeuvres will be provided by Nook Kitchen. Tiki Cocktails available for purchase. How do these plants & trees impact our palate? We discover the affects these apéritifs have on our sensory and digestive system. We will use that knowledge to craft a cocktail hitting all points of the palate for maximum pleasure. If you only think of tastes & flavors when mixing drinks this interactive talk is for you. Free Seminar. RSVP Mandatory. Hosted at Bar Bianco. Featuring Elijah Craig and Larceny Mint Julep Bourbon Bar & Pama and Domaine de Canton Bubbly Cocktail Bar. Hosted at The Arrogant Butcher, come on by and create your own craft cocktail! This event is FREE and requires no RSVP! Azuñia Tequila's Master Distiller Salvador Rivera Cardona leads an in-depth discussion on tequila production, the current agave crisis and other hot topics during a 3-course brunch and cocktail pairing. Hosted by Chico Malo and Azuñia Tequila. $25 for 3-course brunch with cocktail pairing. Limited Seating Available. To RSVP call 602-603-9363 or visit chicomalo.com. Bring your questions about agave farming, the tradition of tequila production and hot industry topics for Salvador, our Master Distiller, to answer. Please join Ketel One Vodka and the Diageo Reserve team at Blue Hound Kitchen and Cocktails inside Palomar to help shake that pesky hangover! We will be offering brunch and Ketel One Bloody Mary's along side the finest locally produced pickled accoutrements from Lillie Mae's Blue Ribbon Pickled Garden to build your ultimate Bloody Mary. But, before you retox you need to detox. Let The Drip Room help you get right. They will be in the house offering complimentary IV Drip bags and B12 shots. Only 50 spots are available for the Ketel One Brunch and even less for the Drip Room. First come, first served so reserve you space now and arrive early to make sure you're able to secure your Drip Room treatment. The party doesn't have to end at The Cocktail Jam! Join us at Blue Hound Kitchen and Cocktails for an exclusive after party, featuring a live DJ, spirits and good times! No RSVP necessary. See you there. Exclusive 4 Course Cocktail dinner presented by Nook Kitchen's Chef Nick LaRosa and Chief Mixologist Michael Gabriel Chavez. Melinda's Alley and Lee Spirits Co. combine their powers to bring you your pre-Cocktail Jam mixer. Specialty menu designed by Lee Spirits and Melinda's Alley. Live Music from The Copper States, free food and a raffle with proceeds going towards Grace and Mercy Homeless Ministries. $1 of every drink sold will be donated to charity along with the proceeds from the raffle. No RSVP Required. A full seminar and tasting of Whiskey Del Bac, finishing up with the very first taste of the special Phoenix Private Barrel of Classic Del Bac at cask strength that we are bottling especially for AZ Cocktail Weekend. The barrel will be allocated between the other participating venues of AZ Cocktail Weekend, and will become available in the other venues after this release event. Seminar will be held at Blue Hound Kitchen & Cocktails in the Palomar Hotel. Step into the Grand Manor. Explore the complex and luxurious world of Grand Marnier through private tastings, small bites, and captivating sensory experiences. You won’t want to miss the surprises we have in store in the Presidential Suite at the Hotel Palomar. RSVP required. Entry based on availability. 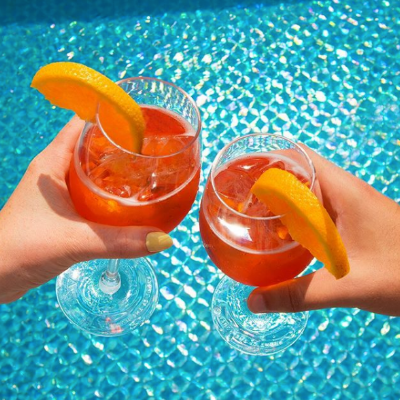 Take a break from the goings-on of Arizona Cocktail Weekend and join us in the Fresca room, right off the 3rd floor pool deck at the Hotel Palomar for a well-deserved Aperol Spritz break. Enjoy Italyʼs most popular sparkling beverage while catching up with friends old and new, by the pool! Join us at the infamous Bitter and Twisted Cocktail Parlour and learn about the history of Carpano Vermouths, along with how different Vermouths affect some of our most beloved cocktails. Foot Massage with your Negroni? As a respite from the hustle and bustle of the conference, the Hendrick’s Lounge is offering an array of spa treatments, from reflexology to facials – along with a lovely array of cocktails. Visit our lounge, compliments of The Hendrick’s Ministry of Relaxation located in Zia Ballroom, Hotel Palomar 3rd Floor. . This is a complimentary experience, but we do ask that guests RSVP online. Space may be limited and offered on a first come first serve basis. Please note, the lounge is also open on Sunday from 10AM to 5PM. RSVP is required. Please join us for a fantastic morning of yoga, brunch and Taqueray No. TEN! We have the yoga instructor from Sutra Yoga Studios hosting the class along with DJ Muchacho Mike on the 1's and 2's. We have the likes of William "English Bill" Codman and Todd Richman both of the Diageo Reserve Program talking about the history and provenance of Tanquray No. TEN. Brunch and cocktails will be offered along with a host of fresh juices for your mixing pleasure following the yoga class. Join us Feb 17-19 on the Arrogant Butcher patio from 9 am-Noon as The Butcher Goes To Austin - all to benefit C-CAP AZ -Tito’s Handmade Vodka Bloody Mary Bar -Austin Style Breakfast Tacos -Local Cold Brew. $5 Pre-sale tickets online, $6 at the door. Join Toki Japanese Whisky as they kick off the weekend with a cocktail party at Lustre Rooftop Bar at the Palomar Hotel. Featuring special guest DJ Sean Derek, whose vibes are distinctive and always soul arousing! This is no ordinary sake. Come learn about how a premium Japanese sake is made. Hiro Sake Junmai and Junmai Ginjo, plus Tokyo Mule will be sampled. No RSVP Required. Hosted at Squid Ink. See you there! !